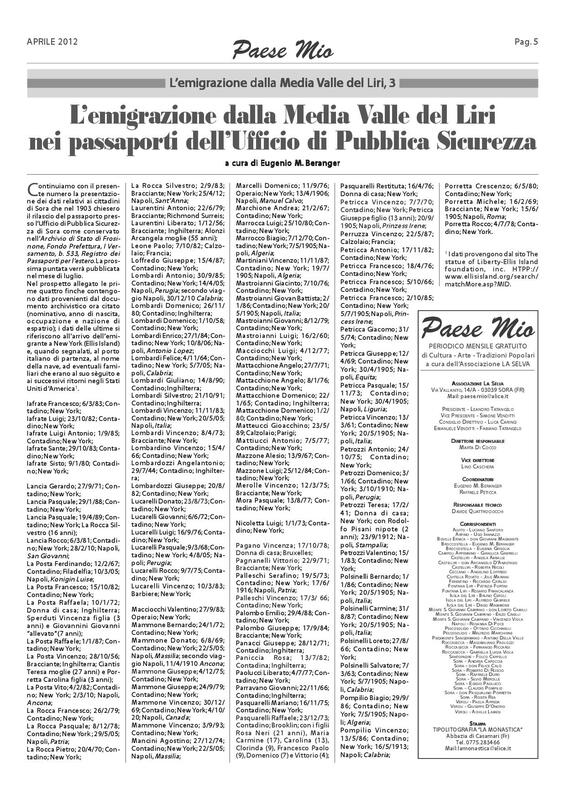 Thanks go to Eugenio Berenger for compiling these lists of persons from Pescosolido who applied for a passport in 1903 in the Province of Frosinone. A partial list of persons from Sora is also shown. Others towns in the Province are listed in the register but we are publishing just these extractions. 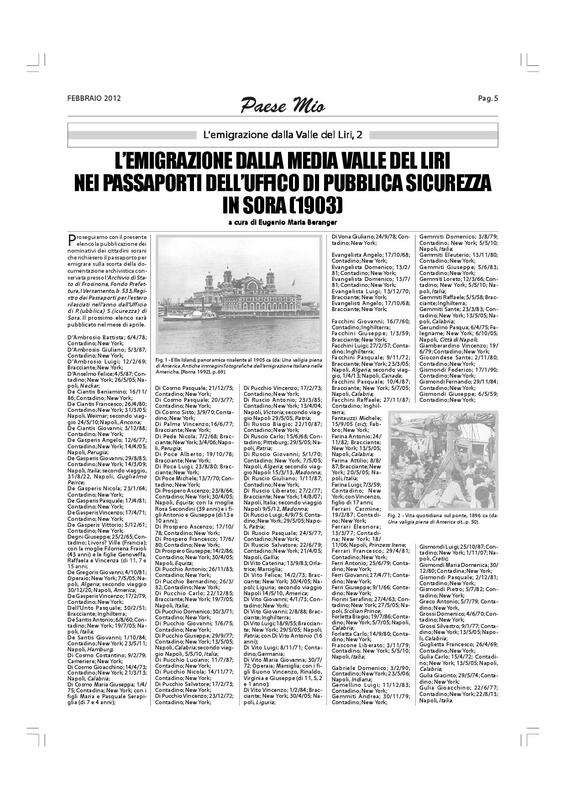 Since the passport register also inclu des persons from Cassino and the surrounding towns who lost their civil records during WW2 this may provide another opportunity to obtain an ‘alternative’ record that can be used for citizenship purposes. NOTE: The decision of whether to permit these alternative records as proof of birth of an ancestor is the decision of the Italian Consulate. Names and birth dates are included, together with occupation in the register. Eugene Berenger has researched Ellis Island records and added destinations and even the ship they traveled on, including the sailing (arrival) date. We cannot guarantee the information added by Eugene but it may help you identify your ancestor. Although passport files including their relevant documents can be found for a small number of years in Naples, I have not found this type of file elsewhere. This ‘nulla osta’ from the Mayor of Isola del Liri to support a passport application to seek work outside the country is interesting. A ‘nulla osta’ was simply a declaration that a person was free to travel and basically was not wanted for any crimes or military service. This one is valid for 3 years and declares Vincenzo Cellupica to be married with two children and on permanent leave from the military service. It gives a detailed physical description together with his birth date and parents’ names. 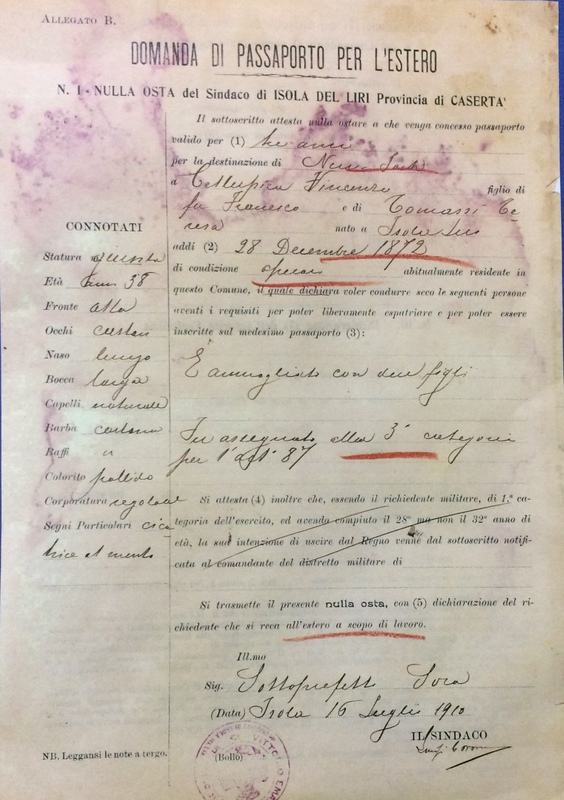 If you need us to check for your ancestor’s name in the 1903 passport register please contact us at italysearch@gmail.com.